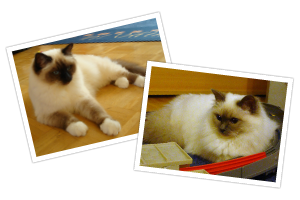 In our Birman Gallery you can see some photos from our Birmans, age ordered. Click on the cat on the photo or on the link of the bottom to go to the pictures. You can enlarge the photos if you click on it. If you have comments or something you want to say to our website we would be happy if you leave it in our Guestbook. And now we wish you much fun looking the pics.